One of the fun things about being in a club that’s been around a while is that some interesting stuff builds up in the historical archives. I’ve an interesting bit or two from the archives to put up on this blog but I thought I’d start with last night’s fun, the Vickers Jubilee. 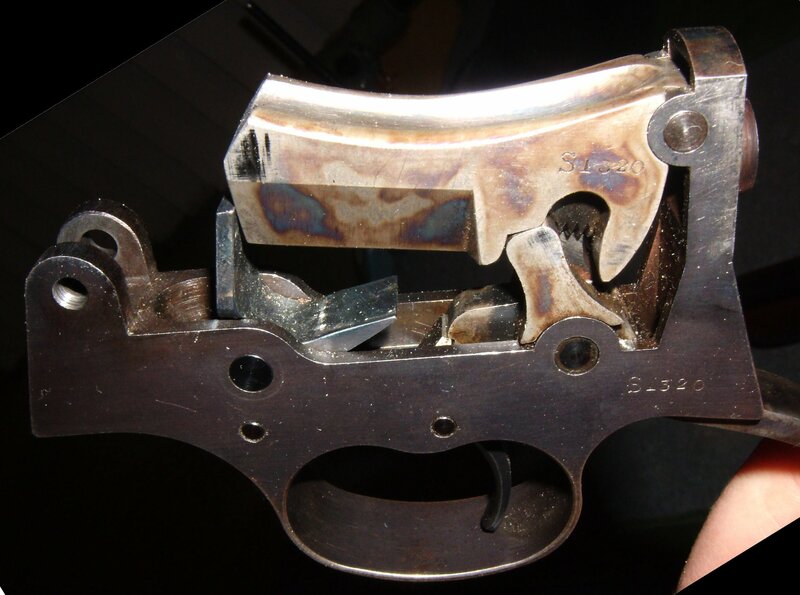 And some firearms have been so optimised for function that the craftsmanship displayed has a kind of intrinsic aesthetic beauty, something that you can appreciate as a separate thing from what the craft itself actually is. 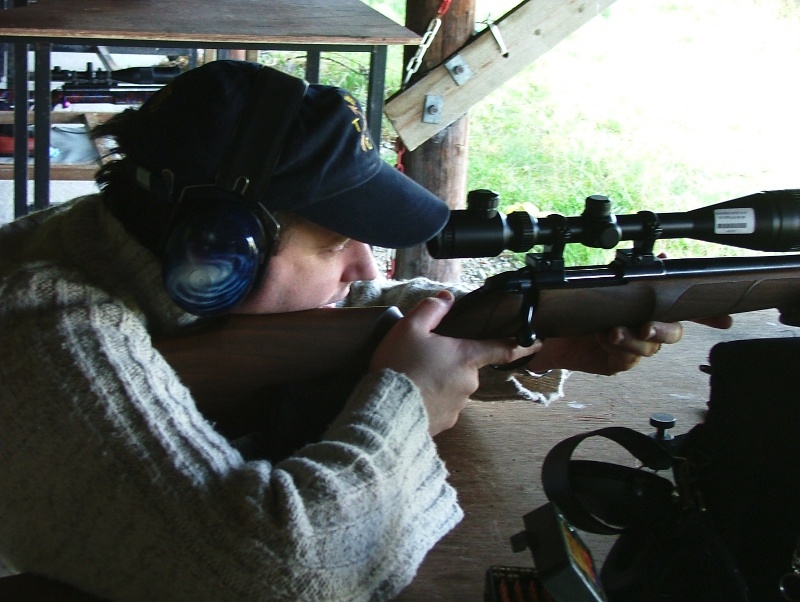 For example, one particular target shooting .223 rifle out in the Midlands has had so much work done on its trigger by its owner that it is now every bit as crisp and clean a trigger release as any match rifle; yet the trigger unit itself is just a standard one, polished and worked to perfection over long hours in the workshop. Shooting with the Vickers gave that sense of excellent craftsmanship and more – this rifle is simply not from our time. Originally manufactured in 1939, it hails from a time when craftsmanship standards were somewhat higher than today and manufacturing philosophy was not the same as it is today. This is evident almost no matter where you look on the rifle, in both fine details and gross features. 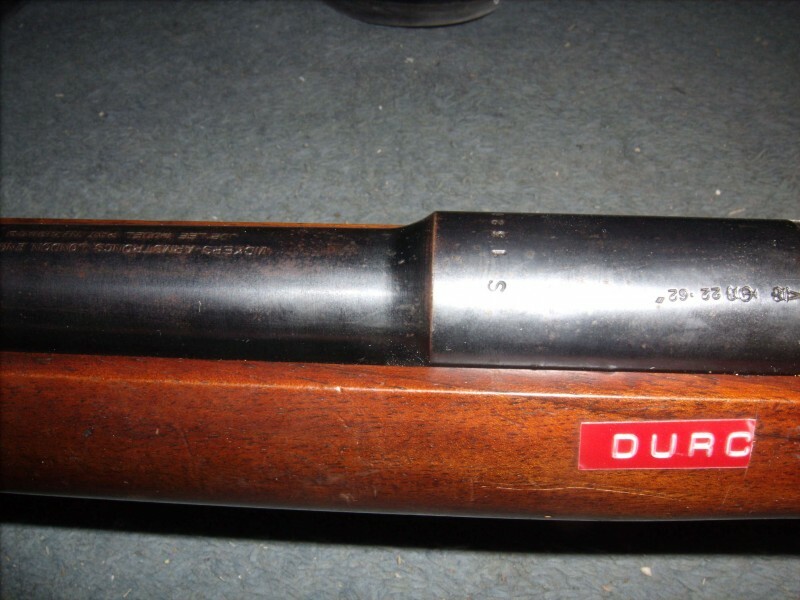 For example, in all modern rifles, the barrel is pinned, clamped, or otherwise connected to the receiver; this allows replacement barrels to be swapped in. This is done fairly often for fullbore rifles, some calibres more than others; but infrequently for smallbore, if ever. 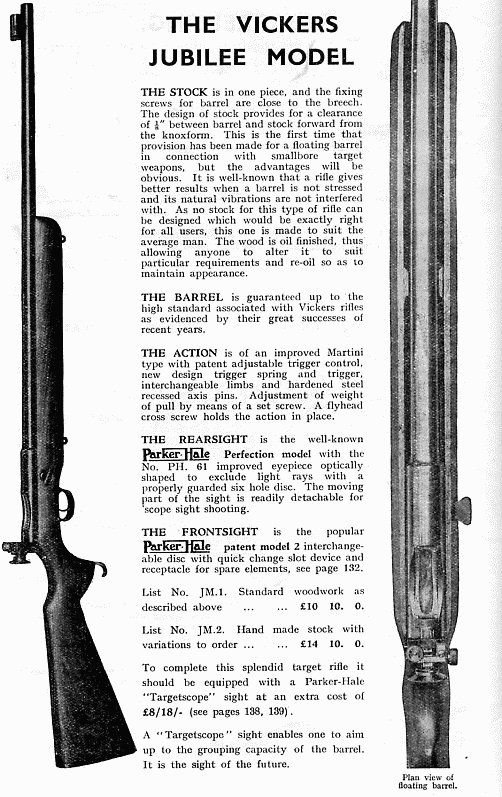 The reason that we have this design feature at all in modern smallbore rifles is advertised as the ability to allow high-end shooters to replace barrels after hundreds of thousands of rounds have finally begun to erode the barrel, or in case of accidental damage — but really, its purpose is to allow for manufacturing defects in a barrel to not require the entire rifle be scrapped, and to allow separate manufacturing of barrel and receiver, thus increasing production rates and flexibility (so you can have a barrel made in one factory mated to a receiver made in another, or whatever works out cheapest for the manufacturer). 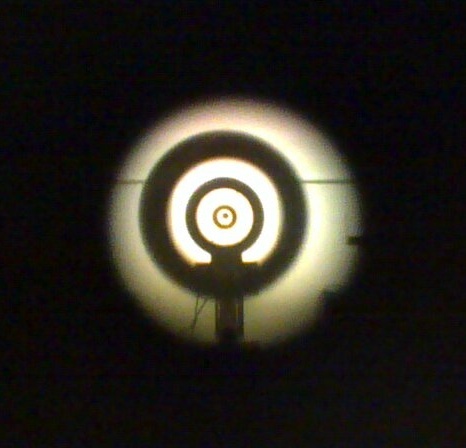 On the Vickers however, as you can see, the action and the barrel are all one piece of metal. To hell with manufacturing a hundred barrels, throwing away the three or four that aren’t up to snuff and making rifles with all the rest; this is the Waterford crystal approach, where you make a rifle in one piece and if it’s not up to snuff, it gets scrapped. There’s more investment on the part of the gunsmith here, and a higher requirement for skill and precision from the gunsmith. And with much of the rifle being handmade or handfinished, that’s more and more evident as you start looking for it. It’s also fascinating to see alternative engineering approaches to problems. For example, in modern rearsights, the iris is like that on a camera, with several leaves that come together to create an iris that’s infinitely adustable over a set range. You can dial in whatever iris setting you want; this is very useful in an outdoor match or an indoor one if the lighting is a bit nonstandard. 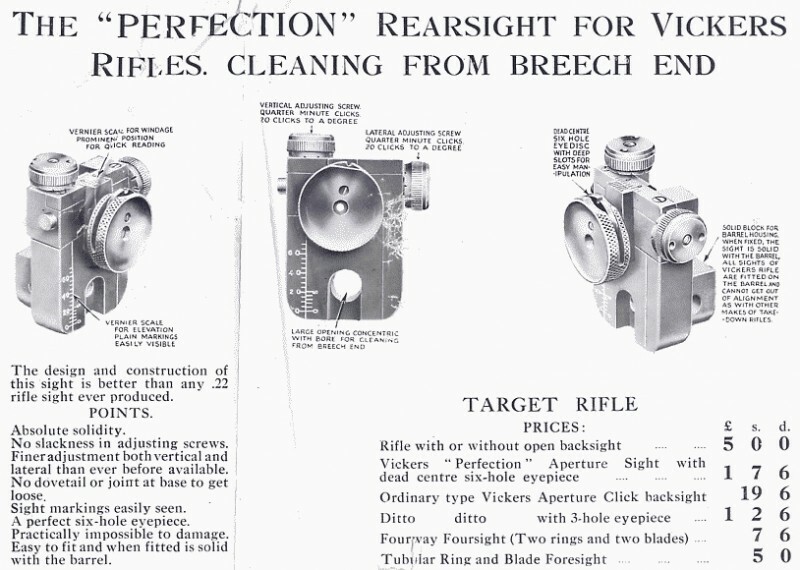 But the mechanics of such an iris, while relatively easy to create today with CNC milling and CAD design and laser-cut metal parts, were quite expensive in 1939; so the Vickers uses a more low-tech solution which nevertheless works quite well: behind the rearsight eyecup, there’s a small rotatable indexed wheel with several holes of varying sizes drilled into it. 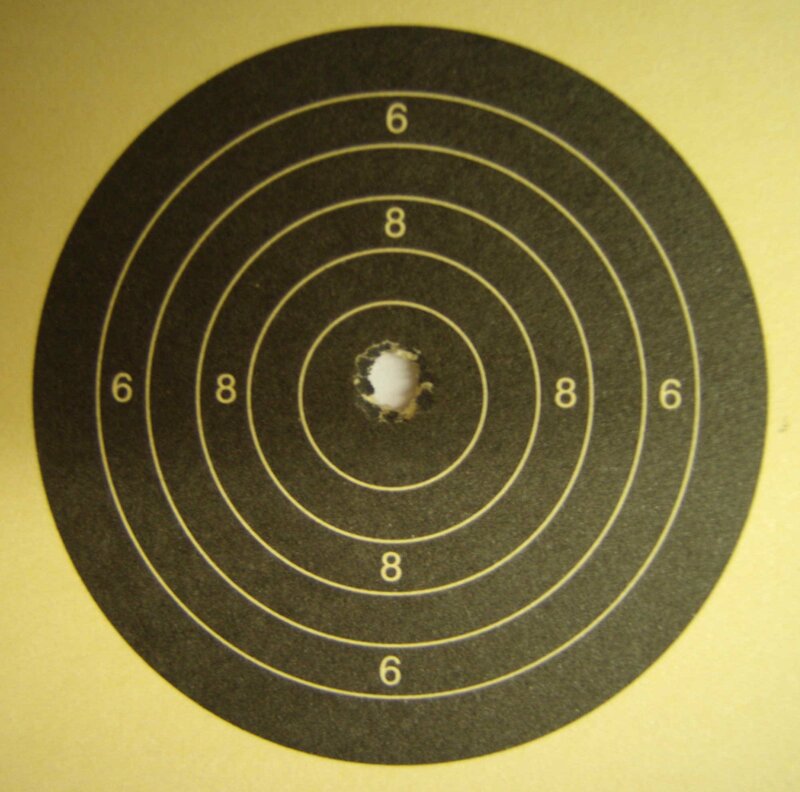 There are far fewer possible settings, leaving the shooter less to get his head caught up in. The sights do the minimum that’s required to give the shooter what he needs; they are not suffering from feature-creep! So some Vickers engineer out there achieved 70 years ago, what todays MEC and Centra engineers are now trying to achieve again today. It’s somewhat ironic. The sights are not the only design trend that Vickers had in 1939 that we’re only seeing crop up again today. The stock itself is lightweight and ambidextrous, making the rifle usable for juniors, ladies, left- and right-handed shooters, equally. Universal design in 1939?! Today you can find several rifles that are ambidextrous in the catalogs, but only because it’s become one of the modern design trends – ten years ago your choices were far more limited. How robust is that? Compared to the match 54 trigger, this thing is a solid hunk of steel fit to be used as a hammer! And once put to that use, you would almost expect it to be unaffected when it returned to its original job as a trigger. In action, its feel is wonderfully crisp and precise, if much heavier than modern triggers. It feels like it breaks around the 1lb to 2lb level, though I’ve not taken a trigger gauge to it. 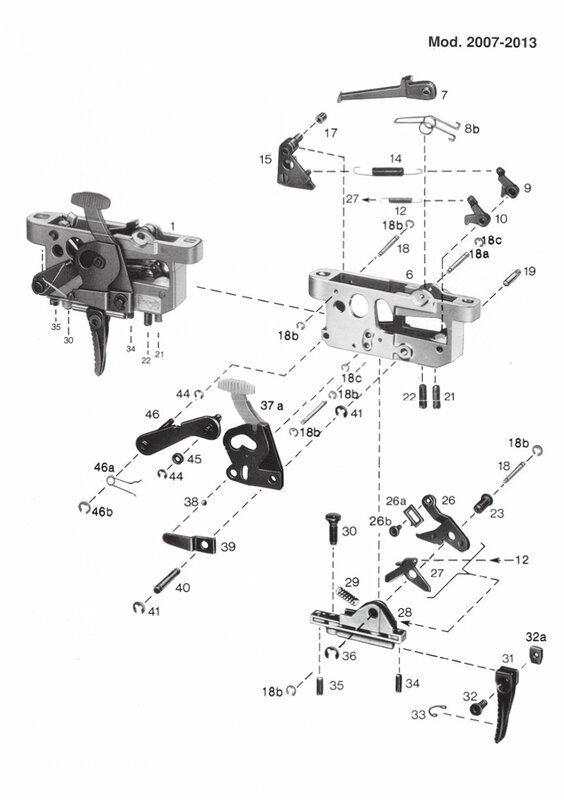 But look at how few moving parts there are – there are, in total, five components, though to be fair one does house four more including the main spring and the firing pin. This is an ambidextrous stock, so that’s the left and right handers taken care of with one rifle, saving money for the club. It’s safe, with a trigger that’s hard to set off accidentally. It’s perfectly accurate and doesn’t suffer from any of the problems with esoteric things like headspacing and the like that modern match rifles have. 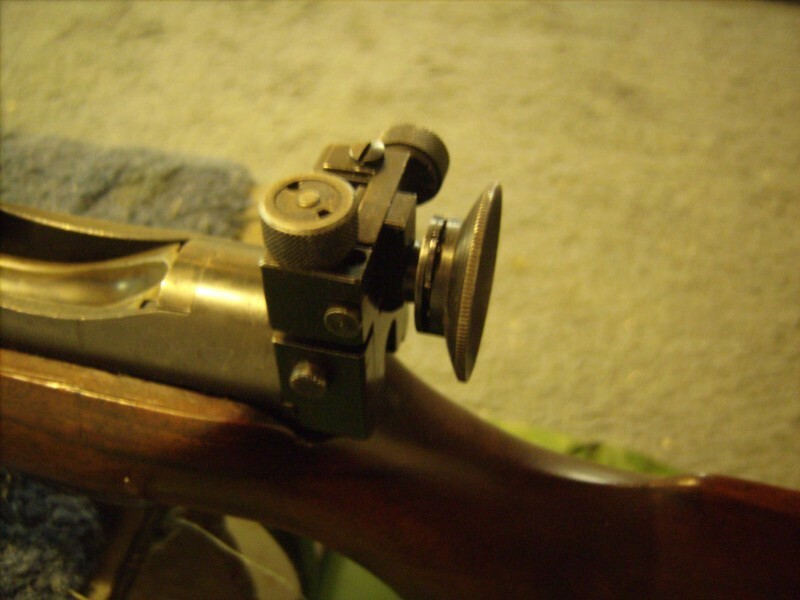 The accessory rail is compatible with all the modern handstops and doodads, so you don’t have to convert those over if you move up to a more modern rifle. The sights are robust enough to work well after seventy years, though you do have to adapt to their working in the opposite sense to the german sights we’ve all been using for the last few decades; but that’s a trivial adaptation. The rifle itself is very lightweight, making it suited for juniors and seniors in both genders. It’s monumentally uncomplicated. You can take the trigger apart completely without a single tool beyond a ballpoint pen to poke out the pins (and if your fingernails are up to it, you don’t even need that). You can take this rifle to the firing point, take it into less than a dozen pieces to show a beginner how it all works, reassemble it and fire it, all in about quarter of an hour. The depth of understanding a beginner can gain from this is enormous and you just cannot do this with a modern rifle – too many parts, too many tools needed, and you’re sunk if you lose even one tiny little grub screw, which on a range is a near-certainty. It’s reliable. Look, this thing was made in 1939, it’s passed through at least two owners before DURC got their hands on it, and it was a club gun for college students for years until it was retired in 1990; and after all that use and abuse and wear and tear, it took less than a half-hour of pottering before it was back and ready to go into service again drilling out the ten as if it was only made last tuesday and hasn’t gotten properly warmed up yet. And it’s built as though the design spec said it had to be usable as a hammer every other weekday. Compare this with the incredibly delicate handling needed with some modern rifles like the Hammerli AR30 or the like. This may well be the single most reliable firearm I have ever picked up. And then to all that you add the last point, the clincher for money-starved clubs everywhere during the recession: the cost. Granted, you can only get them second-hand. Granted, the easiest place to find them is the back room of any UK gunshop, which may not be terribly convenient. And granted, sooner or later these things are going to become collectors items. But right now, a Vickers Jubilee can be picked up second-hand for about €60. No, not a misprint. Sixty (six-zero) euro. 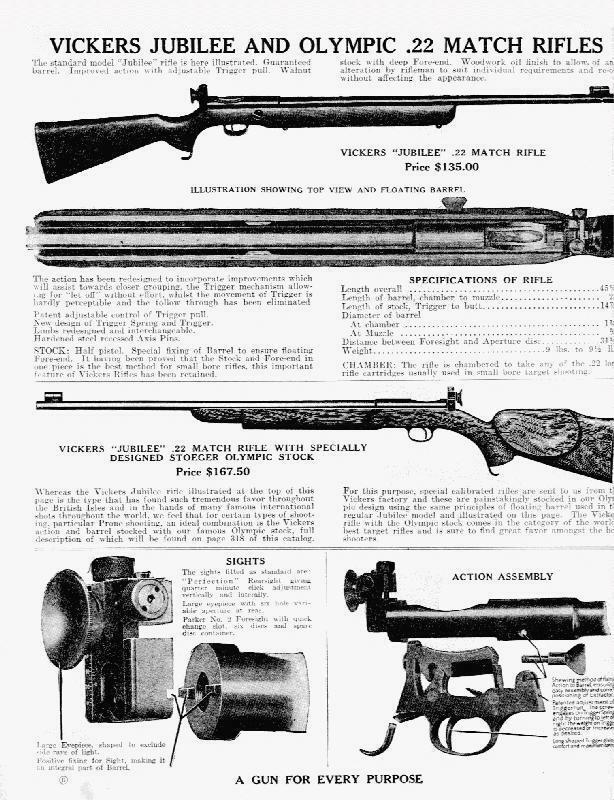 How the heck Anschutz and the other manufacturers are supposed to compete with that for a club or beginners rifle, I don’t know, unless it’s through hoping noone’s ever heard of the Vickers. It really is the most impressive little unassuming firearm I’ve seen in a very long time. 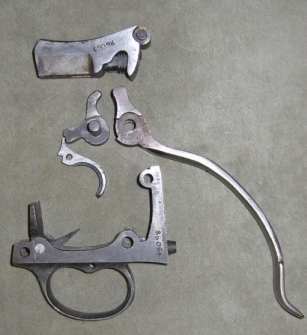 For more information on the Vickers, and its many contemporary rifles, I recommend the excellent UK Historic Arms Resource Centre Miniature Calibre Rifles Research site, which has a wealth of information on these lovely little bits of engineering. 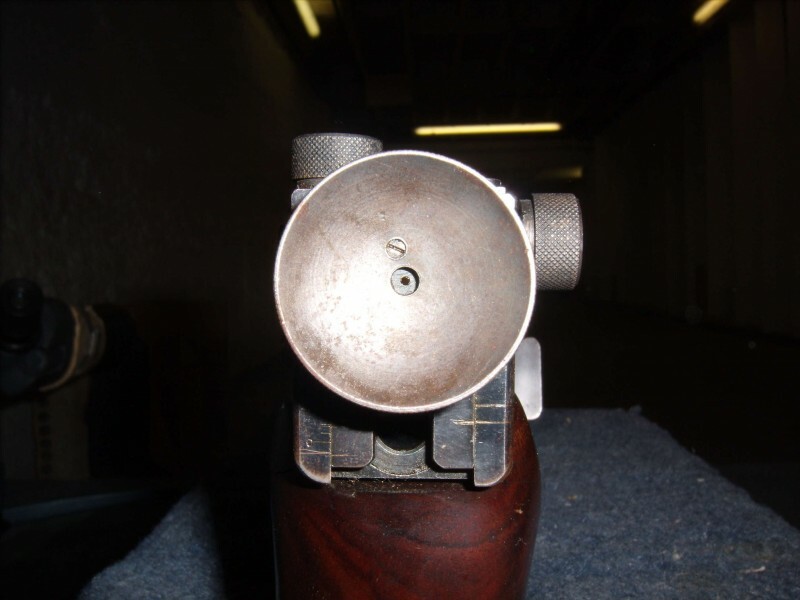 Posted on April 4, 2010 by Mark Dennehy in DURC, General and tagged anschutz, beginners, martini, match 54, rifle, smallbore, trigger, vickers.